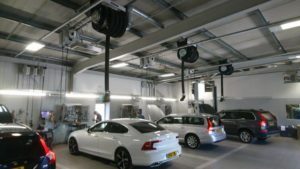 "Now installed at 2 of our sites and do exactly the job they are supposed to do for us"
Herschel was contacted to specify a heating solution for the workshop areas at Snows Volvo, Kingsworthy site. Following the installation of the heaters at Snows Volvo, Kingsworthy, the client was really impressed with their performance and wanted to use them again in their new building.They have now been installed at a second site for Snows Fiat, in Millbrook. The Snows Kingsworthy site needed heating for their site to cover the work bays, tyre fitting benches and MOT bay. Following a desktop survey, Herschel Advantage IR3 1950W heaters were wall mounted near the bench and desk areas as well as Herschel P4 heaters which were suspended more centrally from the ceiling. SImilarly, the Millbrook site was specified with Advantage IR3 and P4 space heaters. This followed a desktop review of architect plans and contractor fit-out drawings. These Herschel space heaters provide the respective workshop managers with a zero maintenance, silent and space-saving heating solution. “Herschel heaters are now installed at 2 of our sites and do exactly the job they are supposed to do for us. They work very adequately for the space, and the people using it, and have provided trouble free heating for us”.